The laying of the cornerstone at St. John's attracted the biggest crowd ever in the history of the Church in Nebraska up to that time - about 4,000 people. In the procession were four bands and delegations from the Ancient Order of Hibernians of Plattsmouth, Lincoln and Fremont, in addition to those from Omaha and Council Bluffs. The Omaha and Council Bluffs branches of the Catholic Knights of America came also, along with other Catholic societies of the City. P.J. 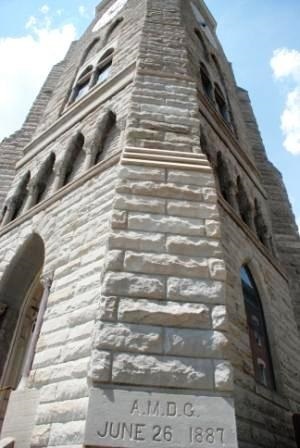 Creedon, an Omaha architect designed St. John's in the English Gothic style. Plans called for a building 184 feet long and 138 feet wide at the transept. The transept and apse, however were not built at this time. Fr. Rigge said that the reason the church was only half completed was the lack of funds, and secondly, its size was adequate at the time for the purposes intended. Less than one year after the cornerstone was set, the new church was dedicated, on Sunday, May 6, 1888, the Feast of St. John before the Latin Gate. Bishop O'Connor presided. One mix up occurred at the dedication. The Jesuits intended that the church be dedicated to John the Baptist, the patron of John A. Creighton. The Bishop, however, had not been informed and the dedicated it instead to John the Evangelist since, according to the Church calendar, it was his feast day. The largest Catholic church in the city of Omaha had no pastor, since it was not a parish. Bishop Richard Scannell, not in favor of people attending St. John's on a regular basis, they were not supporting the parish in whose territory they resided and had obligation to support. As early as 1892 plans were being made to make St. John's a parish, though there were legal difficulties that had to be ironed out. In January of 1897 an important announcement was made by the Bishop, apparently after the arrangement had been approved by Rome, St. John's was now established as a parish church. After World War I, a building committee was formed and put out a pamphlet outlining its plans for finally finishing the church as originally planned. The committee recalled the history of the foundation of the church, that all the expense then was borne by the Jesuits and John A. Creighton, so that the people of St. John's had been treated to the unusual experience of receiving a practically free parish church. The work began in May of 1922. The old communion rail of wood was replaced with one of Canna marble and with massive bronze gates that weighted 300 pounds each. Sheets of rolled gold, melted down from old jewelry, watches and school medals, were prepared as a plating for the tabernacle. One of these pieces dated from 1874, a ring originally belonging to the wife of Edward Creighton. 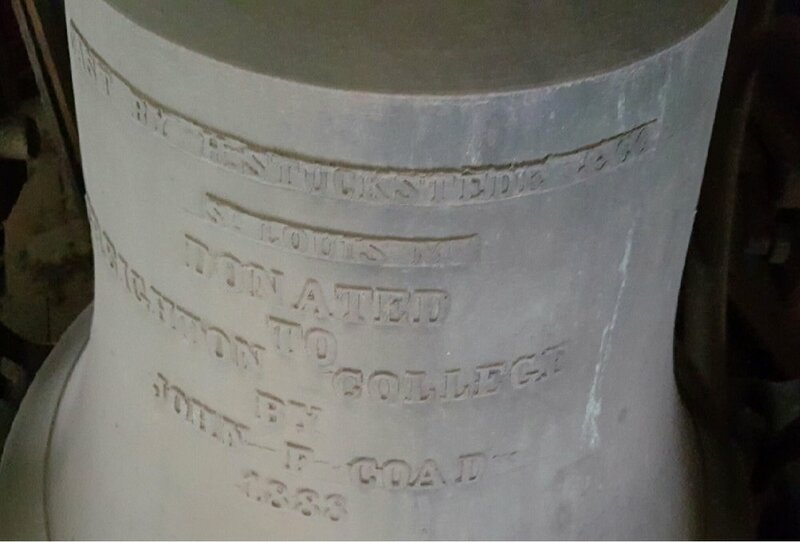 The children of St. John's school were the principal donors of the precious metal for the tabernacle. In September of 1923, the completed addition was ready to be dedicated by Archbishop Harty. Bishop Patrick A. McGovern a member of the first graduation class of Creighton College and the only bishop consecrated in St. John's, came back from Wyoming to give the sermon for the occasion. It took some time before all six side altars were installed. Fr. Rigge has documented the entire building process from the time the work began in May of 1922, until the last altars were consecrated in February of 1927. From 1946 to 1949 the present stained glass windows along the sides of the church were installed by the Schmitt Studio of Milwaukee. In 1948, the large window in the choir loft was equipped with new stained glass and design. A new organ was installed and dedicated in 1952. A move able altar began to be used by the students in 1967 at the 9 o'clock morning mass and the priest for the first time faced the congregation, reciting prayers partly in English and partly in Latin. In an effort to have a more active participation of the congregation, community singing was introduced. The old choir was disbanded. In 1968 the church is renovated, carpeted, and the sanctuary extended. The front pews reoriented to the new Altar of Celebration. In 1976 the steeple was added to the right tower. The original design called for a lantern which was omitted out of concern that the added weight might damage the 90 year-old structure. In 1983 the church interior is painted, and in 1989 the church is renovated, and carpeted. Reconciliation rooms are constructed near the front of the church.